What? A book review two weeks in a row? It’s almost like this is actually a blog about writing and not just TV shows I like. Huzzah! 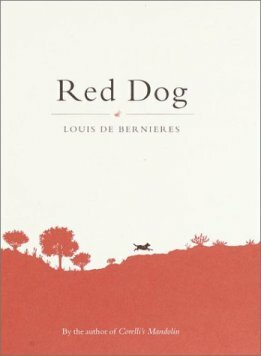 Last week I read Red Dog by Louis de Bernieres, which might very well be one of the cutest books ever. It is super duper short–I was through it in about an hour and a half, and I’m a fairly slow reader (yes, really–I just read a lot)–which means it isn’t much of a commitment. This is the kind of book that you read when you need a break from Literature With Substance and just want something that’ll make you happy. Seriously, you guys, it is adorable (even though SPOILER ALERT the dog dies at the end shhhhh). Red Dog is a biography of sorts, because it’s based on a real dog, and tells his entire life story. It focuses on a Red Cloud kelpie who ingratiated himself with the rural townsfolk of Western Australia, to the point where he was registered with the province so that he would never be mistaken for a stray–under the title “the Dog of the North-West.” Red Dog, as he was affectionately dubbed, was famous for his persistent charm and his ability to show up whenever something exciting was about to happen (particularly if there was food involved). He slept wherever he liked, and he’d travel about the area by hitching rides on trains and buses, or in the cars of people he knew, and he’d often grace their vehicles with his alarmingly potent flatulence. General consensus was that he belonged to everybody. Like I mentioned before, Red Dog was a real dog. There’s a monument to him in Dampier, Australia, which dubs him “the Wanderer of Pilbara,” because everything in Australia has cool names. A little research turns up a number of other books about Red Dog, as well as a movie, none of which I am familiar with, so we’re just going to leave that there. The main selling point of this book for me, aside from the fact that it’s about a dog and I am kind of a freak about how great dogs are, is the down-to-earth, casual prose style. It’s clearly written to reflect the attitude of the people in the stories, and the time period in which they lived: sort of rough around the edges, but kind-hearted and easy going. It reads like a community history–like many different people are telling you their stories about Red Dog directly, though it’s written in third person. Quite a bit of the dialogue features Aussie slang, which is a nice touch. I’m lucky enough to have had some experience with true blue Aussies, so I didn’t have much trouble with it, but you might appreciate the glossary at the back of the book. Fair warning, though: there are two moments when the story gets sad, and they hit surprisingly hard. Most of their strength probably comes in contrast with how fluffy and delightful the rest of the story is–it really does feel like it comes out of nowhere–so if you’re the type of person who gets upset about things that happen in books, be on your guard and maybe have some tissues ready. One minor quibble I have to pick with Red Dog is a couple sections toward the end where the narrative gets female characters mixed up, calling them by each other’s names. There are only three of them to begin with, and it would have taken some really minor editing to fix, so it’s annoying to see those moments where the ladies are so clearly marked as interchangeable. There is also quite a lot of “men were men, and women were women!” mentality going on, but that’s to be expected from what is essentially a frontier folk tale collection. The text still passes the Bechdel test, so minor victories. Plus, I’m pretty much willing to let anything slide when there’s an adorable dog involved. Sue me.